Welcome to Macro Flowers Saturday 60! I wish you all (and myself) a cool weekend! 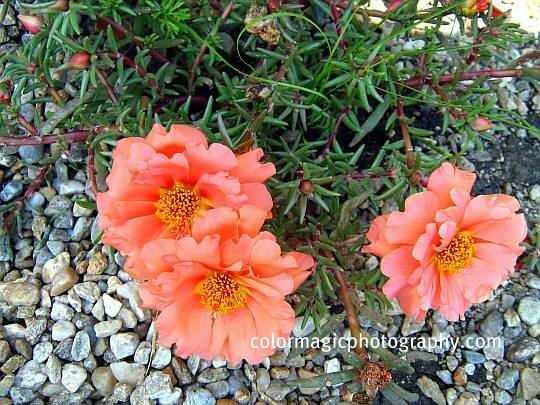 Moss rose (Portulaca grandiflora), this tiny but amazingly beautiful flower is one of my summer favorites. As a child, I was obsessed with this flower and I still am, I think. Each time my mother or grandmother rushed me to the nearby grocery, I came back with moss roses and planted them in our patio border. 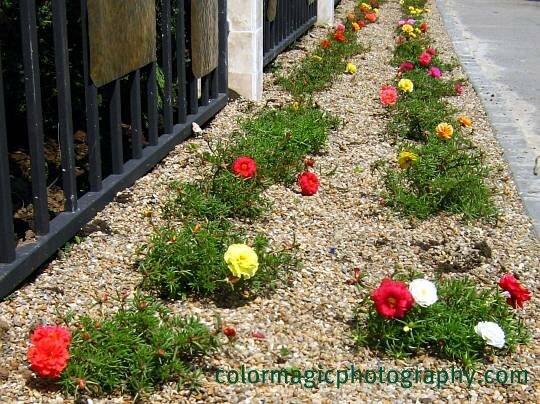 I think I already shared this with you but a few days ago I passed by this brand new, double petaled moss rose border and I just had to take some more photos of them. 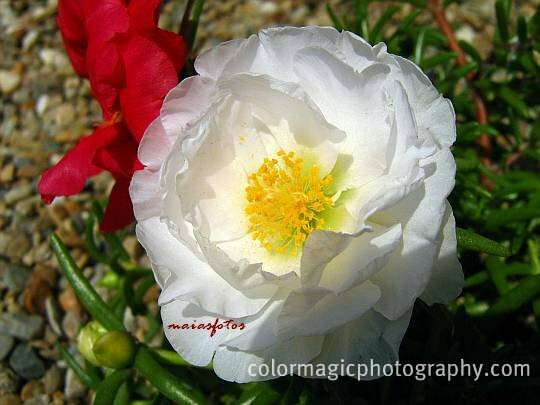 Moss-rose is grown as ornamental plant throughout temperate climates. The whole plant is not more than 10 cm tall, with thick, flashy, about 1 cm long tiny leaves and with flowers in all colors of the rainbow, except blue. It is a self seeding annual spreading itself very easily. 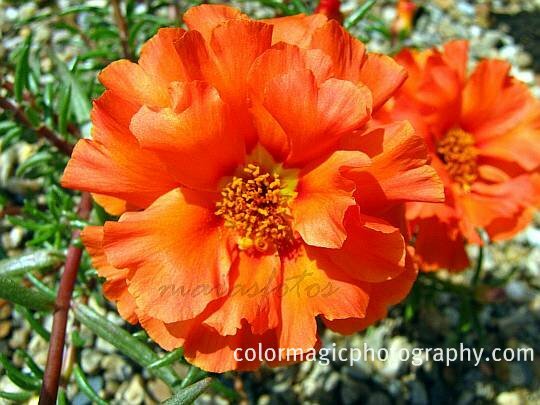 Moss rose grows in sandy soil in full sun exposure. This delicate flower closes its petals at sunset and on cloudy days and opens again in the Sun's company. Though moss-rose requires almost no human attention, with its pretty face it gets too much of it; a few plants are already missing from this newly planted border, as you can see in the first photo. I swear, I was not the one who took them. What a pity that some big children can't leave them be! This Macro Flowers Saturday list is closed for new entries but, please do visit the list of participants. gorgeous macro flowers!! Stunning color! I am doing roses too. But yours are simply gorgeous! We called them Japanese Rose here, so tiny and always flowering all year long. Easy to grow too. Love your photographs. What absolute vibrant colors. The details are so fine tuned and just beautiful. That orange colored one is extraordinary. Moss rose -- hmmm-- new for me, thanks. Lovely flowers. Amei estas flores coloridas e lindas! They can really take the sun and heat, not so much of a problem in Seattle! I think they're neat, too. In Asia, we call them Japanese Rose. I grew them in Singapore. The moss roses are so beautiful, I really like the orange colored one. Beautiful photos. Love the moss roses. I want to have some in my garden. Nancy, those are gorgeous flowers...I've never heard of them and gosh, in NC we have plenty of sun. I'll have to look them up in my nursery catalog and see if they gorw here. I love the salmon color! Maia, thanks for your comment. I don't understand what you mean about the wibya bar and indexing. I just linked up like I usually do. I used your button code on your sidebar in my post. Please let me know if something is not acting correctly. Thanks. I love rose moss. I don't see it as often these days as I once did. My grandmother grew it along one side of her house and it was beautiful in the summer. Very nice pics! They are very beautiful! Love all the colors!